I have a question. I know Russian and watch the political situation in Russia. In the Russian opposition, Alexey Navalny has become popular with his anti-corruption foundation. He gets millions of views about corrupt politicians and calls for citizen protests. He took part in the Yale World Fellows program. Can you get information about him from different sources and publish an answer on your website? “Alexey Navalny exposed many real traitors and thieves in Russian government, including Putin and Medvedev. His videos, which are exposing the elite—the thieves—are amazing. However, the Russian Patriots know very well that he is paid opposition. You can understand Russian Patriots knowing that so-called American liberal institutions that were financed by Soros have promoted Alexey Navalny and financed him for a long period of time. I’m writing to you because we don’t know where else to raise our concerns and ask for Protection and Intervention. We have reasons to believe that the Deep State / Cabal is planning to exterminate us on or after March 21, 2019. They are going to try to cause enough unrest in the country to call a state of emergency (where we will be picked up and disappeared) and/or start a civil war here in South Africa. 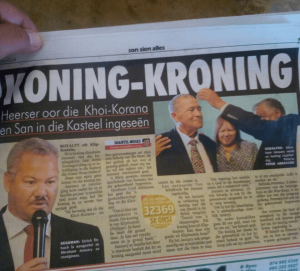 They will use a False Khoi-San King by the name of Calvin Cornelius who fraudulently pretends to be the King of all the Khoisand people. He is stealing the identity of the man in the picture below, King Abraham January, the Legitimate King of the Korana Tribe, as we have five recognized Tribes and each Tribe has its own King. King Abraham has all the documents to prove his legitimacy, of land ownership, letters from Queen Victoria, and proof and photographs of his Great Grandfather, also known as King Abraham January and King of the Korana Tribe, who passed away in 1845. This poor man doesn’t get anyone to assist him financially or in anything, and we fear for his safety because the false leaders want to silence him and all of us permanently. 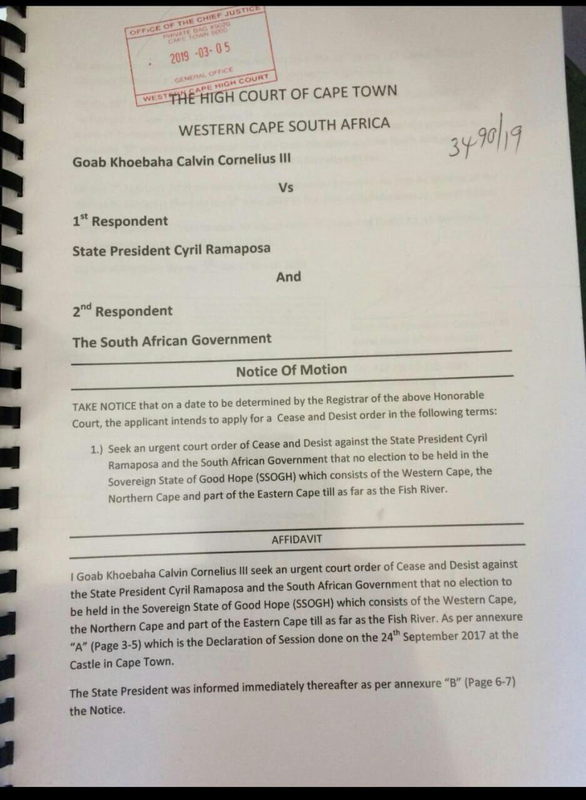 The False King, Goab Khoebaha Calvin Cornelius 3rd, took the South African Government to Court (see below). They are trying to re-create the German Nazi concentration camp methods, by threatening people who didn’t register with his “new country” and don’t have the necessary paperwork, to be arrested. Calvin Cornelius gave some cryptic messages of Ezekiel 40:1, where it speaks about 25 years of captivity (2019 – 1994 = 25 years after Mandela and the ANC political party took over the country). It also speaks about a city that was smitten. Then one reads about burned offerings. 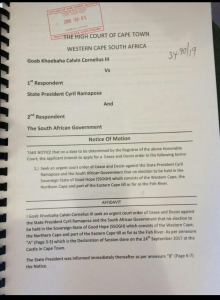 It becomes clear that the Deep State has now decided to part ways with the ANC Government and they are trying to put two radical factions in place; namely, Calvin Cornelius for the Khoi and San people, and/or Julius Malema of the radical EFF political party who wants to confiscate all land from the people and put it in the hands of the state, because he believes he is going the win the elections on May 8, 2019. The current State can’t even run a state-owned enterprise (see the Zondo Commission on State Capture) on behalf of the black majority. The Deep State does not want a peace-loving King like King Abraham January in place. They are planning a civil war (see link below). 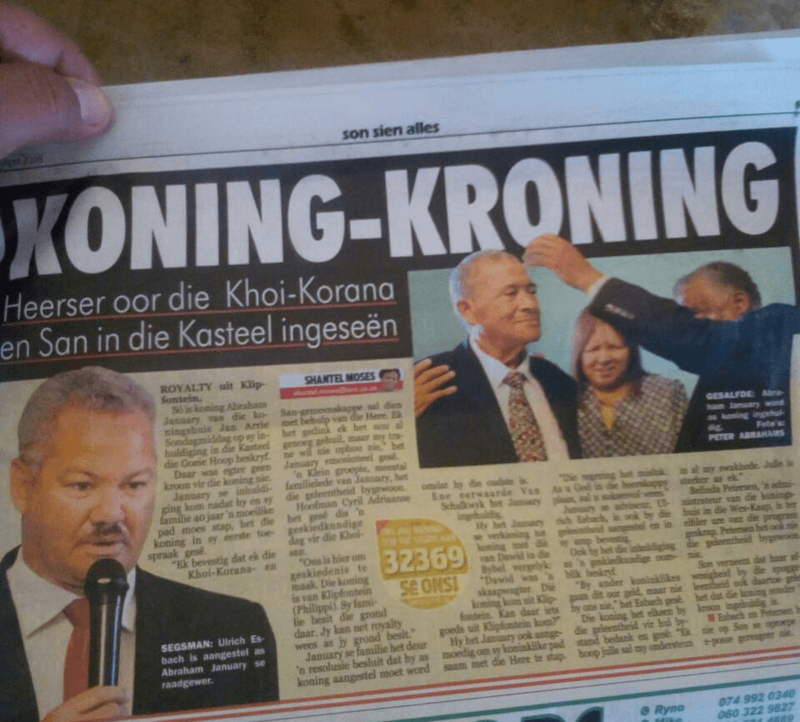 One of our Khoi-San leaders attended a meeting he was not supposed to be at and discovered how the white leaders and the black leadership were dividing the land amongst themselves (behind closed doors) without any Khoi or San leadership participating in these decisions. Could this meeting be about the allocation of land after their created civil war (the spoils of war)? Who is running South Africa? 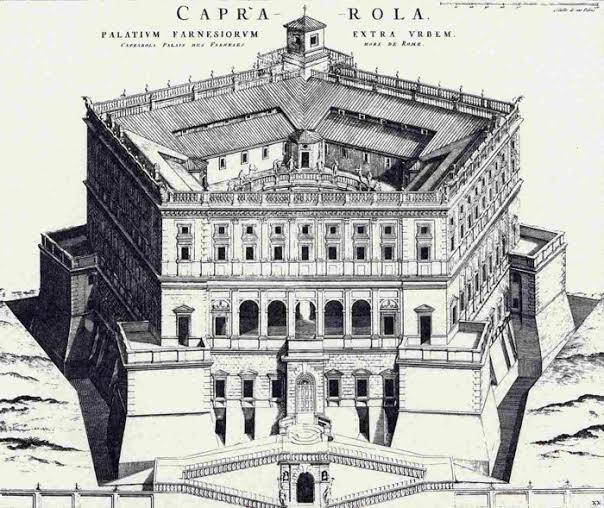 We discovered in your article dated 2019/03/06, it was mentioned about the cabal family named the Farnese who built their first Pentagon in Caprarola near Rome in 1540. I believe that they control the Oppenheimer and Rupert families that are currently controlling South Africa. 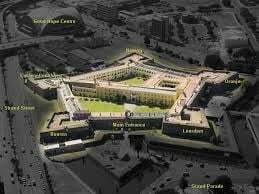 We believe we have evidence of their second Pentagon being established in Cape Town, South Africa in 1666 by Jan Van Riebeeck. This means that the Pentagon in the USA is their third. It also comes as no surprise that in 1666, in London, during the Black Plague and great fire of London, the Parliament enacted an act behind closed doors called “The Cestui Que Vie Act 1666,” where everyone (i.e., we the sheeple) was declared dead and their properties taken. We hope you will be able to guide us to channels who can intervene and save our people and country from these mass murderers. Much appreciated. Okay, let us start by publishing your letter. Publicity always hurts these criminals because the light of truth is their worst enemy. Thank you for your work, which gives me faith that our Light serves a purpose. I hope you don’t mind me asking—are there opportunities for people to be included in the Planning Group to come, which seems to me to be an evolved version of the United Nations? If works are already under way, I would love to be involved or engaged in a capacity suited to my skill levels. Grateful of any information you might be willing to share. I am not a spy or of dark intent. I have a small family, live in a small community, and have very few assets. We are still in the planning stages, but when things get started we will make sure you and all well-meaning people like yourself have a chance to get involved. You said in your article that the Farnese family are Italian white nobility. The main Archon black nobility families still worth noticing are Orsini, Aldobrandini, Chigi, and Farnese. It is interesting to note that the world map from the 16th Century shows Antarctica, which was officially discovered in the 1770s. Around that time the Farnese decided to use the Jesuit Adam Weishaupt to create the Illuminati, elevate the Rothschilds to power, and move the Farnese seat of power to Washington, DC. They built their second Pentagon there. The Jesuits are working under the command of the Archons to maintain the quarantine status of planet Earth. 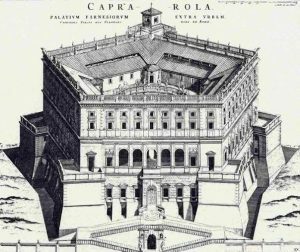 It is good to realize that the Jesuit organization is a 16th Century creation of the Farnese family, which is one of the most powerful papal Black Nobility families in Italy. Not sure if you came across this, but I thought you would find it interesting. Last week, the BC Centre for Substance Abuse released a report calling for “heroin compassion clubs” where addicts can buy heroin from the government instead of someone on the street. All part of their “harm reduction” strategy. And here’s the kicker: all the heroin is being imported from Switzerland. They won’t release the name of the Swiss company or names of any of their board members due to “security issues.” So the Canadian government is about to buy millions of dollars worth of heroin from Switzerland and sell it to our country’s most vulnerable, all in the name of safety. Here’s the report. Information about Switzerland is on page 24. Keep up the great work, Ben. I look forward to your articles every week. P.S. Any more information about Neil Keenan? I really hope he’s not actually dead. You might be surprised by this, but I actually support legal heroin. Let me explain why. I had a friend in Vancouver who was a fisherman who owned his own boat. One day he was asked by some drug smugglers to recover some heroin they sank at the bottom of the ocean after being chased by the Coast Guard. He did so and they gave him $1 million plus a kilogram of heroin. He got addicted. When he ran out of the heroin they gave him, he quickly ran through the $1 million to buy more. His wife took the kids and left him after she found him shooting up in the family bathroom and he was unable to kick the habit. The last time I saw him, he was living in his boat, having already sold the engine (80% of the boat’s value). He would soon move to a flophouse where he would live with other addicts. If he had been able to go to the doctor to get heroin instead of the drug dealers, maybe he would not have lost his house, his family, his boat, and his dignity. The money would also have not gone to the criminals. The Swiss experiment of giving heroin to addicts resulted in a huge drop in crime committed by junkies and many of the addicts were able to get jobs and eventually get off heroin. As far as Neil Keenan is concerned, I repeat he is dead and his killers are faking his identity. They have refused multiple opportunities to prove otherwise.